The foam wiggle minnow has been a mainstay streamer for me for trout and other predatory game fish for years now. When you combine its realistic swimming action and the significant water it pushes during the retrieve, its one of the best streamers I know of for calling in fish from great distances to eat. Plain and simple, the wiggle minnow will catch fish just about anywhere you visit in both fresh or salt, regardless of the water conditions you may find yourself fly fishing. Furthermore, it also fishes well on all types of fly lines (floating, intermediate, sinking) and on a wide range of rod weights. This can prove to be very valuable if you find yourself on the water with limited gear options. Wiggle minnows come in a wide range of colors and you can easily make your own versions. The last few years, I’ve been experimenting with modifications to my wiggle minnows in the effort to improve their fishability. The first aftermarket change I made was to add an articulated marabou tail and a small stinger hook to the fly. For those of you who’ve fished the wiggle minnow quite a bit, you’ve probably noticed it can be difficult at times to get solid hook ups with them. Quite often, fish will smash the fly hard but won’t eat it fully. It’s very similar to the behavior of great white sharks feeding on seals, which often choose to stun their prey only during the first attack, that way they can come back seconds later for the true kill and eat. They use this two stage attack to eliminate the risk of injury during feeding, and several predatory fish big and small use this technique when foraging on large prey. I’ve found that by tying in a small stinger hook (size 12-14 scud hook) off the back of the wiggle minnow, it will increase my hook up rate 30-50%, and I won’t miss nearly as many fish that short strike my fly either. The sparse marabou tail also does wonders for exaggerating the wiggle action in the water and it increases the size of the profile without adding too much bulk. 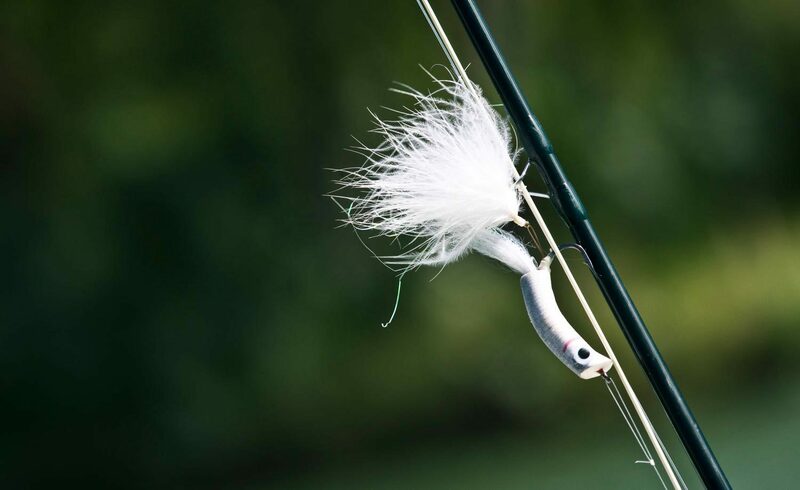 Too much bulk on the articulated section of the wiggle minnow will destroy the action of the fly. Recently, I’ve been applying a variety of adhesive tapes to my wiggle minnows as well. Lead tape works awesome (wrapped on the hook shank under the body) for decreasing the overall buoyancy of the fly, and will help your wiggle minnow suspend in the water in between strips. The suspended action during your retrieve is great because it makes your fly resemble a wounded or dying fish in the water. The lead adhesive tape also helps you get a little more depth during the retrieve, which is nice if you’re fishing the fly on a floating or intermediate fly line. If you don’t tie your own wiggle minnows, you can add a small amount of lead tape to the belly of the fly, but too much will hinder the action. I’ve also really enjoyed using holographic adhesive tape on my wiggle minnows as well. The highly reflective tape provides the fly with a ton more flash in the water. Some days a super flashy wiggle minnow will out perform your standard flat colored versions. 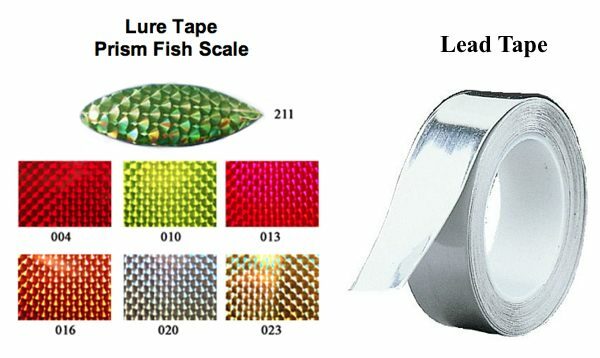 If you shop around you can even find holographic adhesive tape that sports realistic fish scale patterns. Try these modifications out for yourself and let me know how they work out for you. This entry was posted in Fly Tying, Streamer Fishing and tagged 3 Ways to Make Your Wiggle Minnow Fish Better, Fly Fishing, fly fishing blog, fly fishing streamers, fly fishing with wiggle minnow, Gink & Gasoline, Gink and Gasoline, how to fly fish, Kent Klewein, Louis Cahill, streamers, trout fishing, wiggle minnow, wiggle minnow fly, wiggle minnow streamer by Louis Cahill. Bookmark the permalink. Do you haev any pictures of your flies showing the evolutions you describe? Might save us some time.